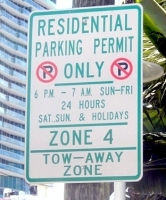 Parking in Miami Beach residential zones 1, 2, 3 and zone 4 is severely enforced. When you park in a residential area during a restricted time, you risk the chance of being towed. The City of Miami Beach and Miami towing companies patrol these areas 24 hours a day, 7 days a week. Visitor-parking permits are for a limited period of time and must be displayed hanging from the rearview mirror in order to avoid a citation or towing. Absolutely all permits are required Monday through Friday from 6pm to 7am and 24 hours on the weekends and holidays. Despite any situation, all guests are required to have a valid permit in order to park in residential zones in Miami. PLEASE NOTE: If the zone on your permit does not match the zone on the residential permit parking sign, you will be at risk. The permit does not exempt anyone from any posted parking regulations assigned throughout the city of Miami Beach.